This spectacular American schoolgirl needlework has it all!!! The large, impressive house boasts 10 intricately worked French pane windows, as well as a stately entry with a leaded, arched window above. In the bottom panel, there is another building topped with a blackbird, a fence with a giant bluebird perched on it, a large fruiting tree and more!! The cartouche around Harriet s name, age and town is a brilliant blue . . . as is the candy-cane cartouche around the verse. 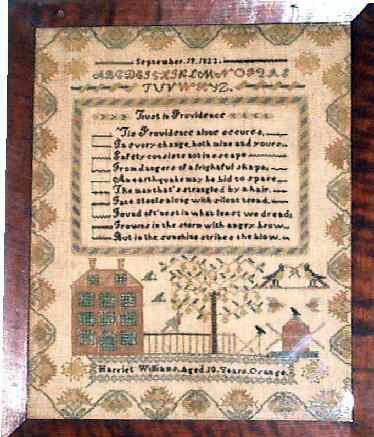 The inscription reads: "Harriet Williams Aged 10 Years Orange (New Jersey)" and "September 19, 1823", the date Harriet completed her wonderful sampler. Preliminary genealogical research shows Harriet was the daughter of Josiah Williams and Sarah (Sally) Harison, one of eleven children born to the couple. She was christened on January 21, 1813 and therefore was 10 years of age when she finished her sampler. The instructress responsible for our sampler maker s remarkable format and verse was surely Quaker as she has included the classic vine-entwined pole on either side of the last line of the alphabet. 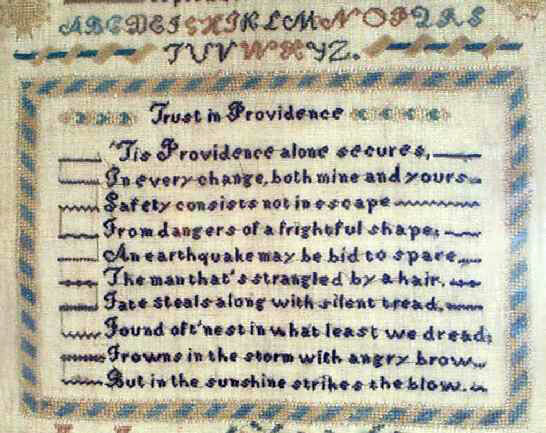 This recognizable motif is commonly found on N.Y. Quaker Female Association School pieces (see Girlhood Embroidery, Betty Ring, Fig 339; The Ann Heyden Sampler . . . Maine Antique Digest, November 1999. Also included are four classic 8-pointed Quaker stars. The condition and color is excellent and unbelievably lustrous. It is Tru Vue conservation mounted into a custom figured cherry frame with tiger maple bead. Sampler Size 16" x 20".